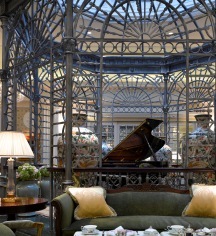 One of London’s favorite and most famous meeting places, The Savoy has traditionally been one of London's preeminent venues and is rich in history and glamour. The three grand Banquet Rooms are well known for hosting lavish social and corporate events while the six Private Rooms are ideal for more intimate gatherings. 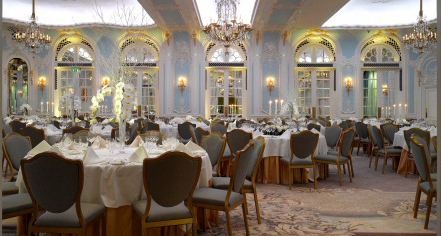 The Savoy’s Banquet Rooms suit social and corporate events ranging in size from 60 to 800 guests. Designed and appointed to create unforgettable first impressions, the sense of occasion in set as soon as guests arrive at the River Entrance in a quiet road off the Victoria Embankment. The beautifully arranged Private Rooms provide a choice of individuality, elegance, and style and are all named after Gilbert & Sullivan operas with the most historic being Pinafore. This is the room where Sir Winston Churchill founded his dining club, the Other Club, in 1911. Traditionally the serving British Prime Minister has always attended a meeting of the Other Club and their portraits hang in this room alongside a bust of Churchill. The elegance and charm of all rooms are also complemented in full by the hotel’s culinary expertise. This includes the option of a la carte menus, a first for London hotels. Advanced audiovisual equipment provides state-of-the-art technological facilities. The distinctive and discreet Savoy service team perfects each detail, from arrival to departure. Choose The Savoy for a memorable meeting and take advantage of the Memorable Meetings Winter 2017 Promotion.